Daisy Hay is a Lecturer in English Literature and Archival Studies at the University of Exeter, and the author of Young Romantics: The Shelleys, Byron and Other Tangled Lives. She is a practicing biographer with particular interests in the intersection of private and public life in nineteenth-century Britain, and in current developments in life-writing and biographical form. Her new book, Mr and Mrs Disraeli: A Strange Romance, will be published by Chatto & Windus and Farrar, Straus and Giroux in January 2015. She is currently a AHRC/ BBC Radio 3 New Generation Thinker, and presented a shortened version of this column on Radio 3’s Free Thinking in June 2014. This post accompanies her JVC article ‘Hair in the Disraeli Papers: A Victorian Harvest’, which can be downloaded here. For the past five years, I’ve been working on a biography of Benjamin and Mary Anne Disraeli. This project has seen me spend months on end in a chilly basement at the Bodleian Library in Oxford, combing through the Disraelis’ papers. Anyone who has ever done any kind of archival research will be familiar with its uncertainties. You can start a day not knowing what you’ll read, whether you’ll be moved, intrigued, or bored. Sometimes a day will pass and at kicking out time you feel like you’ve learnt nothing. On another day something will surprise you and send you tumbling down a rabbit hole through the centuries, in search of solutions and explanations. As a biographer of Romantic and Victorian subjects, I am a practiced tumbler down rabbit holes. I’ve spent weeks of my life deciphering cross-written love letters, cross-referencing manuscript documents with contemporary newspapers, and hunting for people who leave only the faintest traces of themselves on paper. But the most memorable pursuit that the Disraeli archive has taken me on hasn’t involved much paper at all. Instead, it has involved hair. 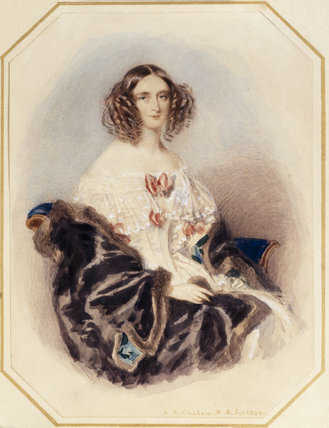 Mary Anne Disraeli was an avid collector, and it is largely because of her curatorial impulses that we know so much about Disraeli’s private life. She kept every letter he received of which she was aware, every letter he sent to her, and thousands of scraps of paper relating to her own life. She kept valentines and commonplace books, inventories and account books, letters from old lovers, and the hair of those she loved. I first came across Mary Anne’s hair collection on one of those mundane research days at the Bodleian, during which I had been laboriously transcribing for hours without finding anything very exciting. Opening a box to discover it was full of hair jolted me out of my stupor most effectively. Here was a lock of hair from Mary Anne’s head, annotated ‘my own hair … 1835’, a bodily remnant of the person who occupied my waking hours. Here was a long, straggly white curl, with its own annotation: ‘my dear dear Mamas hair cut off the day I lost her’. Here were curls from the heads of children Mary Anne knew, one of whom I knew to have committed suicide in adulthood. And here was I, feeling distinctly squeamish about all this bodily material, marooned by the strength of my own reaction from my scholarly training. The Disraelis and their contemporaries would have thought my squeamishness ridiculous. The Victorians were avid hair collectors. They cut it from the heads of dead relatives and live lovers; they wrote novels and produced paintings which represented the giving and receiving of hair as a symbol of devotion. They had it made into jewelry, although young women were encouraged to learn how make such jewelry at home, rather than to entrust their precious mementoes to unscrupulous commercial manufacturers. In an age before photographs were easily reproducible hair offered the illusion of intimacy with the absent, a symbol of the body more animate than a portrait. Now that my work on the Disraelis is nearing completion, I wonder why all this hair has stayed with me so strongly. I think it’s because it reminds me that there are stories lurking in the most unlikely places, and that sometimes those stories aren’t represented on paper. It’s reminded me too of the things that survive from the past, and the things that don’t, and of the complicated ways in which we create symbols of our relationships with others. And it continues to remind me of the rich possibilities of those archival rabbit holes, and of the joy to be had in letting oneself tumble.